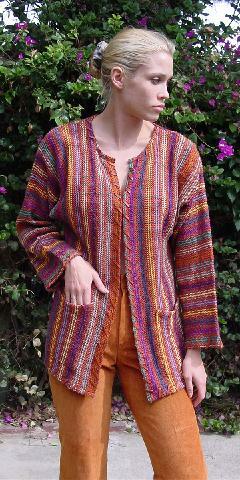 This vintage woven jacket is 45% linen, 29% rayon, 15% acrylic, and 11% wool, and was made in Hong Kong. The soft leather trim goes all the way around the jacket and is also on the top of the pockets and around the sleeve bottoms. It was used in an editorial photo shoot. The jacket and Leather International pants were from a New York stylist's collection. 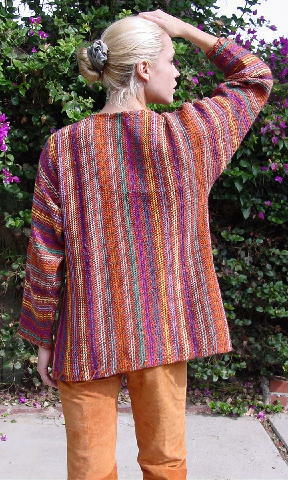 If this were a Missoni jacket, you'd be looking at a price tag of over $2500. Wear it with a dress, jeans, or leather pants. Use it as your "conversation jacket". neck to end of sleeve 26"